A blocked drain can cause all manner of problems so the sooner it is fixed the better. If you are currently experiencing difficulties with your domestic or commercial drainage system in Broadstairs, call us on 01843 293 040 and we will dispatch our engineering team to your home or business without delay. We offer a 24-hour emergency service for those times when an urgent solution is paramount, as well as a standard unblocking and repair service for all other occasions. Whichever service you request, we will be happy to provide you with a detailed and accurate quotation before we start work on your drains. If you are going to hire a group of professionals to unblock your drains, you will want to make sure that, however much you are charged, it proves to be worth the expense. At BP Drains we make sure that our customers are guaranteed value for money every time they use our services. Speedy Response – Our local offices and 24-hour cover ensure that no matter what time of night or day you may need our services, we will never keep you waiting. We know how inconvenient blocked drains can be, which is why we strive to provide our customers with the fastest response times in the industry. Efficient Engineers – Our highly skilled and experienced engineers are experts at getting to the heart of any drainage problem and solving it quickly and efficiently. Once our team arrives on-site, you can relax, safe in the knowledge that your problems will soon be over. We never fail to unblock your drains, whatever the root cause may be. Competitive Rates – By keeping a close eye on running costs at all times, we are able to hold our prices at very low levels. We are determined to provide our customers with the very best service in the area at the most competitive rates on offer. Permanent Solutions – We always ensure that whenever we are called upon to perform a drain unblocking in Broadstairs or the surrounding area, we do the job properly, first time. 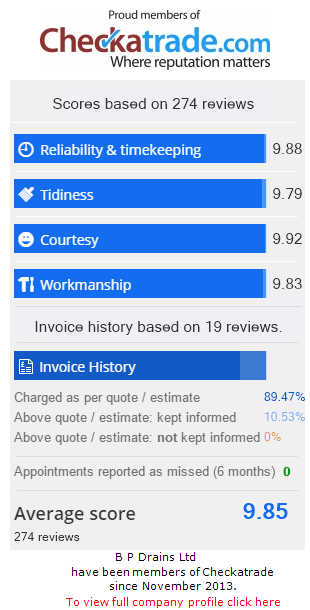 We know how annoying it can be to pay good money for a professional service, only for the exact same problem that was fixed to reoccur a few days or weeks later. When you entrust your drainage problems to BP Drains, you can look forward to a long-lasting, effective solution. In the event that something you are doing is likely to cause further blockages, we will inform you of this fact and advise you how to avoid a reoccurrence in the future. Whether you would like us to unblock your drains or to take advantage of another of our services, such as a CCTV survey on a new home before making an offer, we promise to provide you with a first-class service at a price that will make you happy. Call or email us today to talk to one of our friendly, experienced technicians about your drainage needs and to request a comprehensive quotation. Buying a Home in Broadstairs?